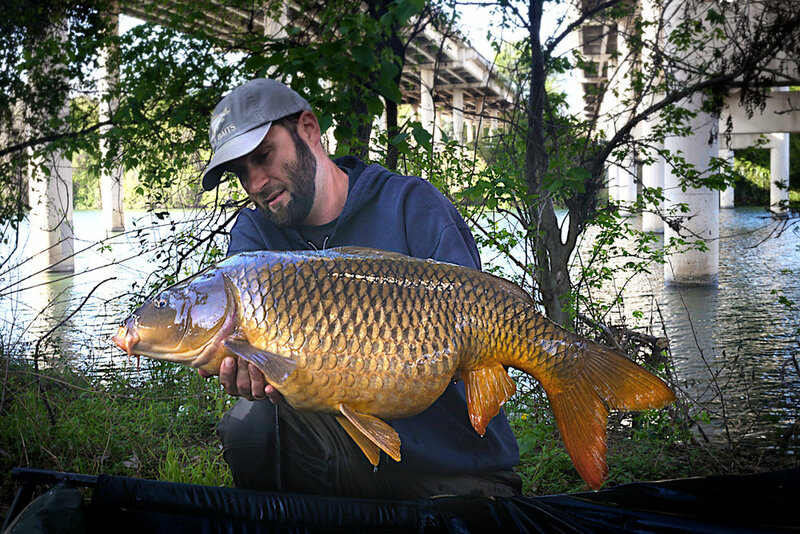 Not so coincidentally at the end of March each year, there is a carp angling tournament called the Austin Team Championship that takes place on Ladybird lake (formerly Town lake) in downtown Austin under the patronage of the Carp Anglers Group. The distance to Austin, Texas is over 1100 miles each way for us and since we have to travel such a long distance, we always want to make the most of it. So we usually plan to spend extra days there pleasure fishing and collecting information about the areas we may be fishing along with the conditions we may be fishing in. Gathering this local information each year is very important because the more we know about the lake, the easier it is for us to identify the areas where the fish are usually located. Our bait and tackle preparation begins long before the tournament and this year, we planned to arrived in Austin seven days before the start date. As tournament anglers, we are forbidden to fish on the lake itself before competition begins but above Ladybird Lake's upper dam, on Lake Austin, there is a wonderful public camping area called Emma Long Metropolitan Park. It is a great location to set up camp and meet the "monsters" living in that lake too. We also allowed time to fish another local fishery called Decker Lake where we also fished for Smallmouth Buffalo. 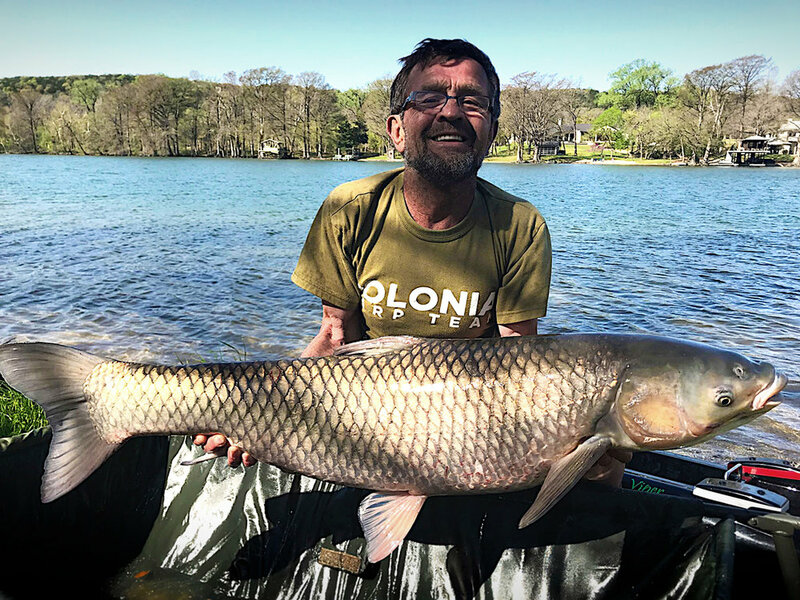 Both Lake Austin and Decker brought us much joy, lots of good fish along with several new Personal Best records; Henryk Burza caught his biggest Smallmouth Buffalo weighing 45lb10oz and Andrzej Burnagiel caught White Amur with a weight of 50lb 2oz! (see photos below). We also caught many other fish ranging from 20 lb to 50 lb, many of which were Grass Carp (White Amur) and Smallmouth Buffalo. A Smallmouth Buffalo caught by Adam Krysiak weighing 51lb 11oz was worthy of mention is pictured below. Everything good must finally end and after a few wonderfully exhausting, hot and very generous fish count days, it was time to pack up and make tracks for the main carp event, the Austin Team Championship. The ATC's organizational meeting which they call the "Corn Boil" was planned for the evening before the competition start day. We spent that time gathering more information about the tournament venue, meeting new anglers, reconnecting with long-lost friends and making sure each of our scales were certified by the officials. Our turn to draw was somewhere in the middle of the pack and we drew a peg which we have fished before, a few years ago. Because of our research, we know the fish are there and they're feeding very well but the peg is huge and even six rods are not enough to check all the possibilities, we just had to find them. Once we arrived at the swim, it didn't take too long (about 2 hours) to have the first fish weighing 25lb 9oz on our mat (pictured below) and two more quickly followed within the next 10 minutes; both were around the 15lb range. We were off to a good, confidence building start but we then had to wait a few more hours for the next fish... Our hard work and patience was rewarded with another beautiful female common weighing 25lb 9oz and by 7 pm at the end of the 1st day of competition, we had caught 4 more decent fish including Henry's biggest of the session at 28lb 7oz. Just as the clock hits 7:00 pm we start packing but as is customary for us, we left our rods in the water as the last items to be packed away... 11 minutes after the ending, one of my rods begins to run, slowly at first but quickly picking up momentum and speed... I set the hook and the fight begins... In contrast to all the fish caught earlier in the day, this fish does not fight but it hugs the bottom, steadily pulling all the time. I estimated it at this time to be around 20-25lb. When she finally hit the surface for the first time, I noticed a huge dorsal fin and right then and there I knew I had something much more than 25lb on the end of the line! Slowly, I try to lead the fish to the landing net but just as before, the fish does not want to cooperate.... In the water it looks about 30lb but when I finally won the battle and got her safely into my net, she looked huge!! Even knowing that she will not count towards our final tournament weight, my legs shook like jelly and I was and still am so excited! The final weight on the scales was much bigger than 30lb and I just can't begin to describe the joy I was feeling. 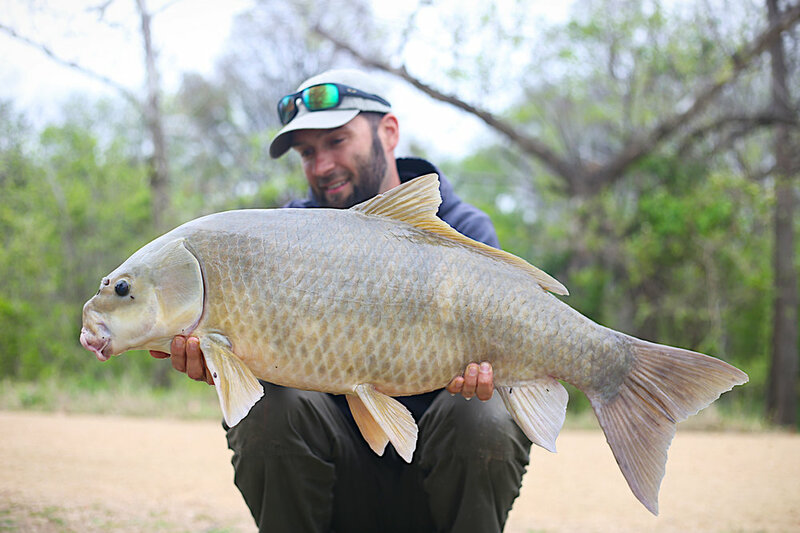 She was the second largest Common Carp I'd ever caught in my life, a beautiful female weighing 36lb 6oz of Texan gold! (pictured below). With a very quick photographic session and the fish returned home to the water. We packed the rest of the equipment and went back to the hotel where we happily find that we're in second place after the first day's competition. On Friday, the second day of the tournament, we wake up 4:30 am, grab a quick coffee, breakfast and head off to the second day's draw. As on the previous day, we draw in the middle of the pack. We're really hoping that we will be able to pull one of the pegs located in the north-western part of the lake, where after analyzing all the catches from the previous day, most of the fish were accumulated. On the other side of the lake "Eldorado" begins. 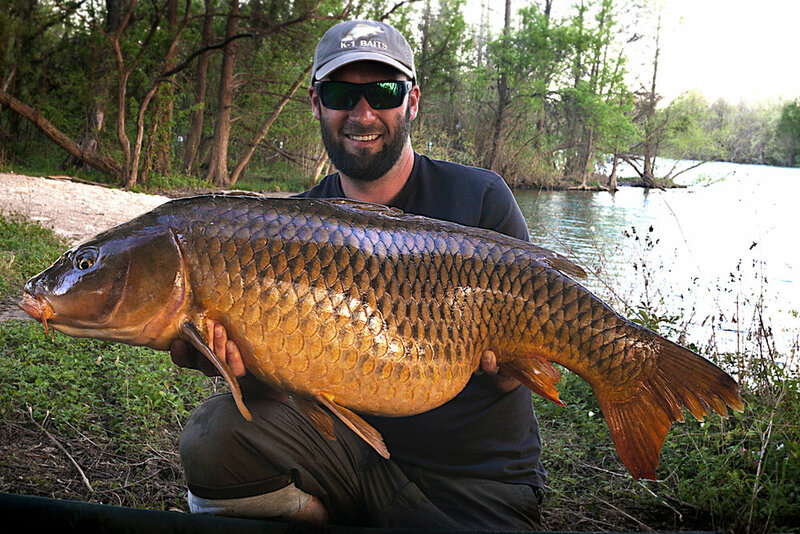 Other teams get on beautiful fish which often exceed 30lb! It puts the pressure on us but we do not give up. The first 5 hours goes by slowly for us without any major changes, one catfish and nothing more.... Then we see a Smallmouth Buffalo start rolling out over out baited area and couple of minutes later, we had a good Buff laying on our mat. The fish did finally find our baited plateau but unfortunately, it was only a few minutes before the end of the competition. Only 15 seconds before the end I get a screamer of a run and after a short fight she weighed in at 22lb....she was immediately followed by another run and a fish weighing 14 lb but unfortunately this fish didn't count. On both days of the tournament the fish did eventually find our baited spots but they arrived a bit late in the day... Well, of course sometimes this happens but at least we know that our efforts and tactics brought us the expected results. After packing the equipment up, we went straight to the award ceremony in Austin and found that we're in a good 6th place with a final weight of 139lb 9oz for our largest six fish. Considering the pegs we drew, we were happy with that and will definitely be using the experience to our advantage the next time we fish the ATC. Ladybird Lake is and always will be on the top of our fishing list because it really is one of the most amazing lakes to fish, and we always look forward to visiting it again with much impatience. At this point, we would like to thank all those who were involved in the organization of the Austin Team Championship as well as all sponsors. Thanks for reading, tight lines everyone! !